Our 2013 Napa Valley Cabernet is a knockout from a vintage that has been declared a modern classic. One sniff, and anticipation takes hold. Beautiful aromas of vine-ripened blackberry contrast perfectly with spicy notes of nutmeg. There is a luscious weight and texture to the wine, but also a racy edge of well-balanced acidity on the palate. 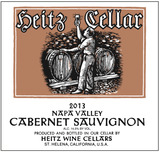 This is an extraordinary Cabernet - powerful, yet elegant, with all the wonderful aging potential you've come to expect from Heitz wines.